SafeSomm wine bottle bags are protective travel bags that helps you safely transport wine, champagne, liquor, olive oils, sauces, scented candles, perfumes or anything vulnerable to breaking while traveling or transporting. The wine sleeves are flat and lightweight so you can easily bring them in a carry-on or checked luggage. You'll never again have to worry about your precious souvenirs breaking during transport. Should anything ever happen, we've added double seal locks and extra hook-and-loop strips to protect your luggage, clothing, or shipment from getting damaged. HOW TO USE: Using your thumbs and index fingers, separate the seal at the bottom and pull to open. Insert the wine bottle all the way into the sleeve, between the two layers of bubble protection. Using your thumb and index, close the zipper-style locking seal until it is fully closed and there are no bumps in the seal. Roll over the end and join the two hoop-and-loop strips together until secured. All done! ★ MAXIMUM PROTECTION for traveling or transporting fragile glass or plastic bottles. 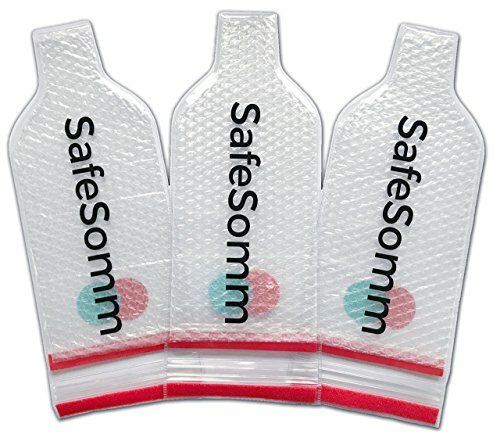 SafeSomm wine bottle protectors are surrounded by a bubble barrier and are made out of puncture resistant PVC plastic for maximum cushioning. You can fit a variety of bottle sizes up to 1 Liter. ★ LEAKPROOF & REUSABLE so you can travel and transport worry-free over and over again! In the case of breakage, SafeSomm wine bags are secured with triple seals and hook-and-loop strips to lock in all liquid from leaking out and damaging your clothes and luggage. ★ SMART TRAVEL ACCESSORY for travel enthusiasts. Give yourself the freedom to bring home a souvenir by planning ahead. Our wine bags are ultra-light and pack flat making it easy to throw in your suitcase or bag for your next flight, cruise or road trip. ★ EASY TO USE for duty free purchases, airport security, and customs declarations. Our see-through design and large size make it ideal for wine connoisseurs, frequent flyers and collectors. ★ GREAT TRAVEL GIFT for the world traveler in your life. Give as a thoughtful gift for Mother's Day, Father's Day, Christmas, or any occasion. If you have any questions about this product by BONDII, contact us by completing and submitting the form below. If you are looking for a specif part number, please include it with your message.